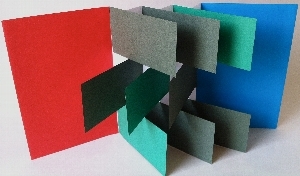 The flag book is one of the most popular and versatile book art structures. It is a simple construction that offers an energetic way to display images and/or words. Comprised of a simple accordion and “flags” the flag book can be designed in such a way that the flags and be individual pages or part of larger image. In this workshop we will create two books. A simple paper flag book as an introduction to the structure and a more finished version with rigid board covers and a ribbon tie. All materials will be provided, but if you would like you can bring some decorative paper for your covers or collage material to decorate your books. This free workshop will take place 10 AM - 1 PM in the Art Department, 2nd floor of the Parkway Central Library. All tools and materials will be provided, but participants may bring their own cutting mats.